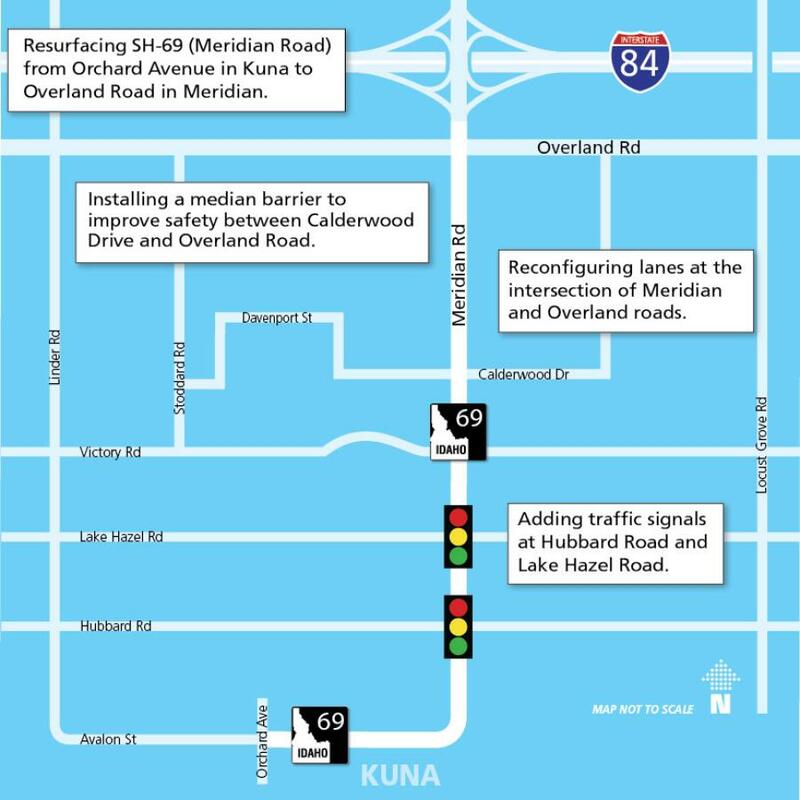 The Idaho Transportation Department has begun a series of safety improvements on Idaho Highway 69 (Meridian Road) in Meridian and Kuna. Motorists are advised to expect nighttime lane restrictions on the highway until early October. Resurfacing ID-69 between Orchard Avenue in Kuna and Overland Road in Meridian. Adding traffic signals at Hubbard and Lake Hazel roads. Installing a median barrier to reduce left-turn crashes between Calderwood Drive and Overland Road. Reconfiguring lanes at the intersection of Meridian and Overland roads to improve traffic flow. ITD worked closely with the city of Meridian and Ada County Highway Department to develop the improvements after a recent safety analysis of the corridor. Crashes on ID-69 increased by nearly 50 percent between 2011 and 2016. ITD reached out to businesses earlier this year to discuss plans for this project. Throughout this project, crews will work from 8 p.m. to 6 a.m. on week nights (Sunday-Thursday) and 9 p.m. to 6 a.m. Friday and Saturday nights. One lane will be closed in both directions and flaggers will direct traffic at intersections. All lanes will be open during the day. For more information, visit itdprojects.org.